This service is the ultimate luxury in wedding planning. It is designed for the couple that doesn't have time to deal with all of the details that go into planning a wedding and desires professional assistance and advice every step of the way (that’s where we come in!). Or services begin the moment you’re engaged and conclude after the final dance of your evening. Signature Weddings will work with you in planning and designing every detail of your Canmore, Banff or Lake Louise wedding; from the venue and wedding vendors to the menu selections, decor, and invitations; we will take the time and dedicate the attention needed to ensure every detail of your wedding day is taken care of. Let Signature Weddings planning team make your Signature Wedding in the Canadian Rockies the best day of your lives. We will step in one month prior to your wedding to finalize all paperwork, plans, payments, schedules, deliverables and anything that is needed to make sure that your wedding plans are complete and ready to go. Our team will be on-site your entire wedding day to oversee all of the logistics and ensure that your event team is in place and functioning as planned. We will be there to ensure that you are able to celebrate with your guests, making it possible for you and your guests to have the time of your lives celebrating your momentous occasion. There is also an optional Decor & Design addition for the couple who would like help pulling together the visual aspects of their wedding. Let us make your dream Canmore, Banff or Lake Louise wedding unfold just as you’ve planned! This service is designed for the couple that wishes to plan their own wedding, but needs help getting started. It is a 2 hour session to develop initial plans and vision for your dream wedding. We will offer creative suggestions regarding theme development and decor design, discuss budget and funds allocation as well as advice on proper wedding etiquette. After your consultation is over, we will send you an electronic version of Signature Weddings by Ashley's extensive step by step planning guide, taking you month by month through the planning process to help keep the momentum going after our session. A La Carte Services: Planning assistance is available as an add-on to either the Pre-Wedding Consultation Package or the Wedding Coordination Package. If you find yourself faced with any challenges later on in the planning stage, where you feel you would benefit from the involvement of a professional; we'd be more than happy to help!! Imagine frosted mountain peaks, glittering glaciers, and sparkling turquoise lakes. 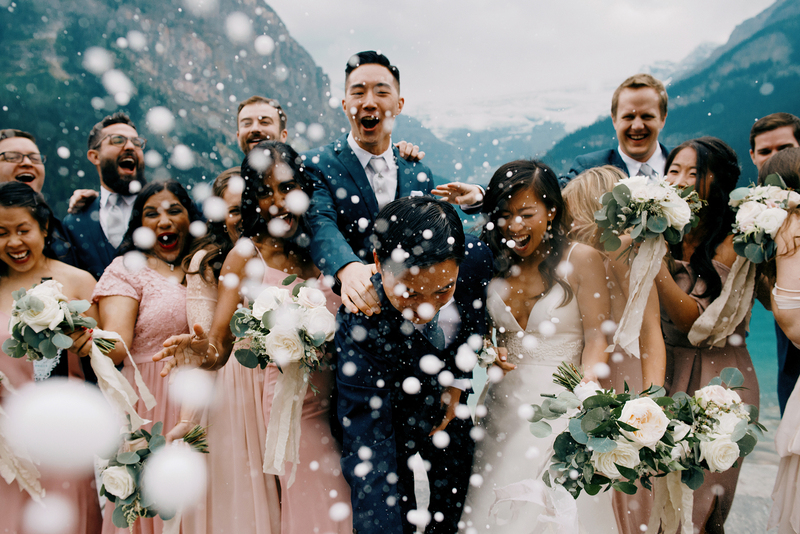 If this is what you envision then we have the perfect elopement package for you, that can take place in an atmosphere of mountain tranquility and breathtaking beauty as you exchange your wedding vows. We will take care of your marriage license and permits, marriage commissioner, ceremony location, flowers, ceremony musician, photographer and a intimate and romantic dinner atmosphere. This will be a true magical celebration. These all inclusive elopement packages can all be customized. We will tailor a package that reflects your unique personalities, style and budget.